BioLet Deluxe is an on-site, self contained, biological toilet, where human waste (feces, urine and toilet paper) are collected, excess liquid is evaporated and solid material is decomposed to a soil-like, hygienically safe product (humus) without producing an unpleasant odor. BioLet Deluxe needs no water, nor chemicals, and there is no waste water discharge from the unit necessitating a connection to a sewer or septic tank. As with all BioLet's models, the BioLet Deluxe utilizes the natural processes of evaporation and aerobic decomposition and is designed to maintain a warm and humid environment inside the unit, encouraging biological degradation of the waste through the scavenging action of the aerobes. Within a relatively short period of time, human waste and toilet paper are efficiently transformed into a small amount of fertile compost. The BioLet Deluxe reduces the volume of the waste entering the toilet by approximately 90%, leaving only 10% of an end-product, which can be recycled back to nature in a safe way, and without polluting the environment. Recirculate air through the system to provide additional oxygen to the aerobic bacteria to accelerate the decomposition process. Assist in the evaporation of the excess liquids and expel them to the atmosphere through the vent pipe. Draw odors from the unit and expel them to the atmosphere. 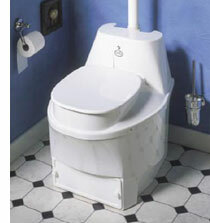 The patented re-circulation of warm air and the adjustable thermostat which can be set according to the number of people using the toilet makes the running cost very low. Required Room Temperature: 64F during periods while the toilet is in use. Additional depth to remove tray - 22"